Oh, I haven’t heard from Victoria in quite a while! We were friends in High School, and now she’s at the University of Michigan Ann Arbor…I wonder what she’s up to…? It turns out that Victoria has been quite busy, though I’ll let her LinkedIn do the talking. As a langzeitige French student, Victoria had decided that it was finally time to spend some time abroad in the home of the language she had been learning – an excellent choice, if I can unbiasedly comment. 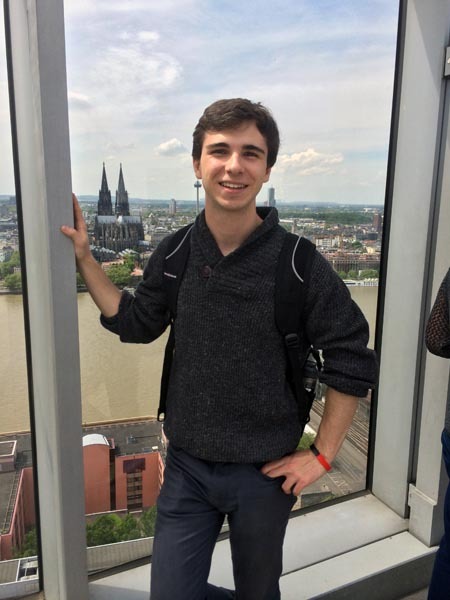 Together with a little more than a dozen French students from the University of Michigan, Victoria enrolled in a six week summer French language program in Grenoble. 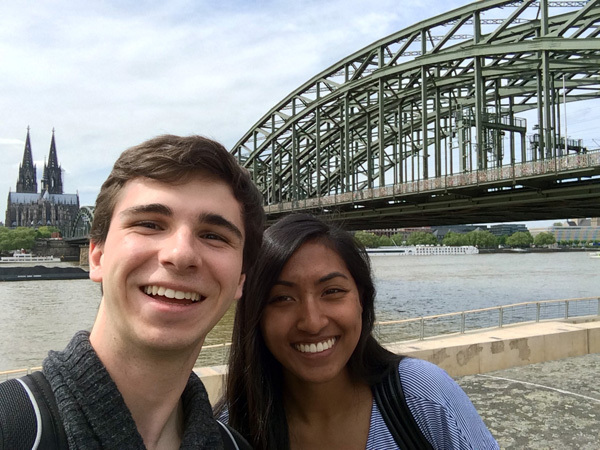 Seizing the opportunity of spending a relatively extended time in Europe, Victoria decided to visit some friends in Germany while she had the chance. We planned to meet in Köln on Friday, the 8th of May. Then horror struck. 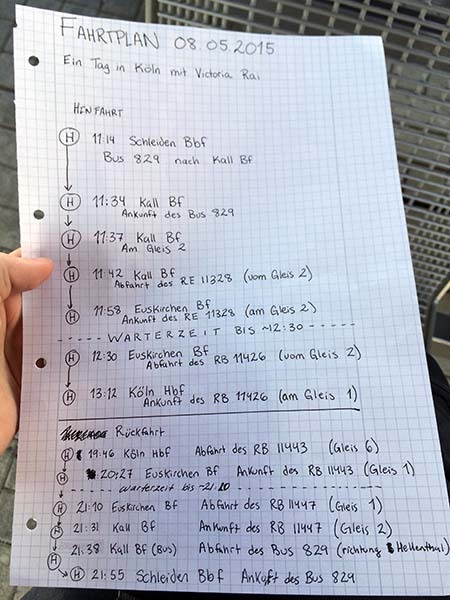 Die Deutsche Bahn went on strike. Well, rather, the GDL (union) began a week long strike under the direction of Herr Claus Welselsky. Practically every train was either canceled or not running its entire planned route. Somehow and someway Victoria’s travel plans remained unaffected, or at least the damage was manageable. Remarkably, both of or rearranged train plans went smoothly, resulting in our midday reunion at Köln Hbf. From here on I adopted the role of Stadtführer for the first time during my exchange year. This was an interesting and frankly welcomed change in relationship function. 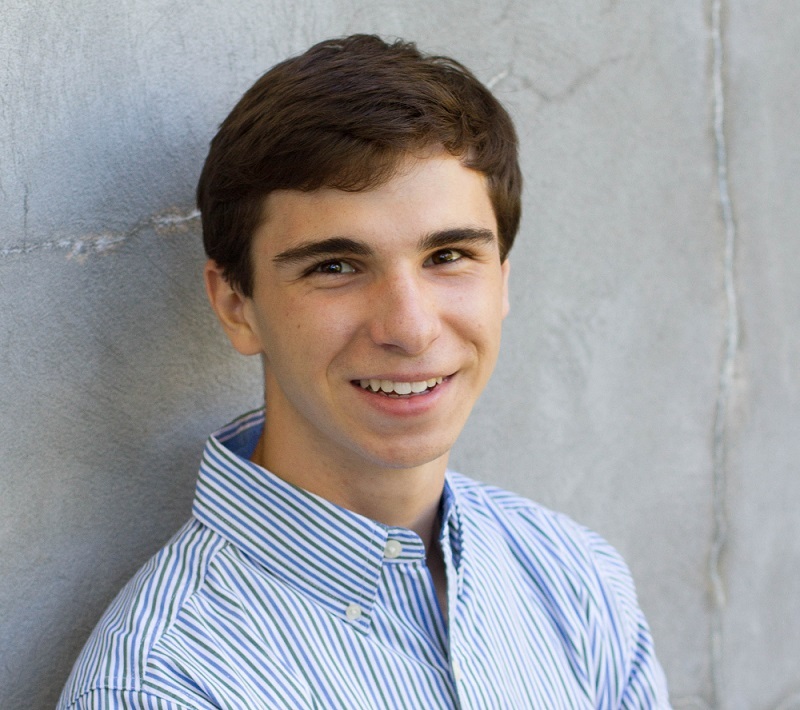 It was hardly a position of any sort of true leadership, though it contrasted to a normal part of an exchange student’s year on program; while foreign exchange does foster independence and self-reliance, an exchange student remains a follower, observer, and dependent for a variable, though significant, portion of his or her exchange year. In layman’s terms, the change of pace from being the one asking questions and depending on guidance im Ausland to the one answering and providing was nice. 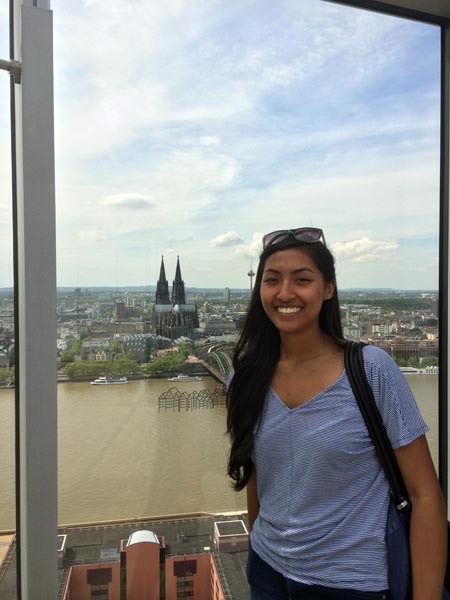 Our first stop was the Kölner Dom, situated just a few steps from the train station’s main entrance, with its twin gothic steeples looming over the swarm of train travelers. Having visited Köln either close to or over a dozen times, and having the opportunity to spend an extended time in other European cities, I’m a little desensitized to the artistic and architectural marvels which US-Americans are always overwhelmed by. Victoria was certainly not, however; this trip was Victoria’s first time to Europe, and her bottom jam dropped lower than the amount of available trains not affected by the strike. Being constructed in the Gothic style, the cathedral’s interior lags behind the Aachener Dom in terms of a wow-factor. Nonetheless does the interior feel larger than what the facade portrays, and Victoria remained baffled. 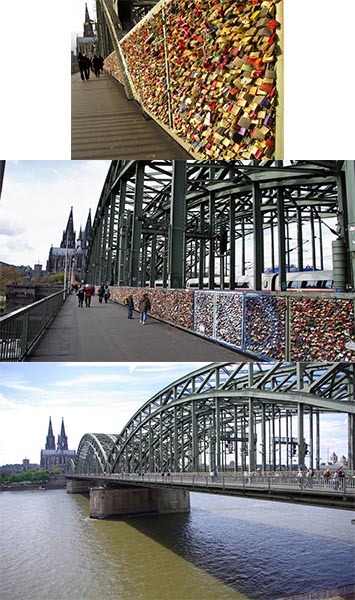 Similar to bridges found all over Paris, the Hohenzollern Bridge is densely covered in love-locks, affectionately bolted onto the entire stretch of the bridge’s railing. 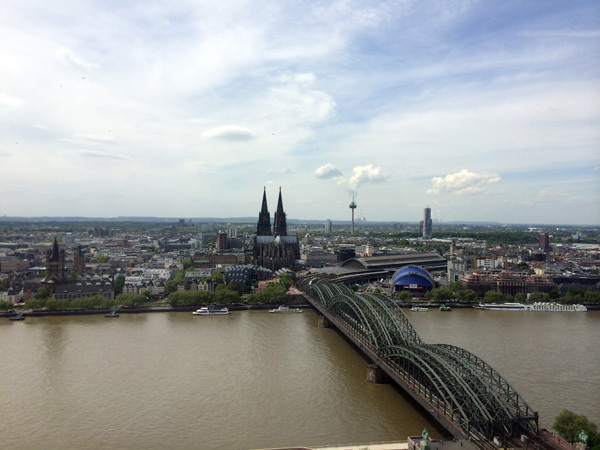 The other side of the bridge is a mostly industrial, residential, and business neighborhood, though the Kölnertriangle provides a nice viewing platform for tourists. The rest of the day was spent wandering along the banks of the Rhein, through the Innenstadt, and eating ice cream.